Avid has quietly released some important improvements to the Smart Tool — features that go a long way toward making Trim and Segment modes function the way they did in Version 4. The updates are incorporated into recent “patch” releases, and therein lies a rub. Patch builds are designed to quickly solve specific customer problems, and they aren’t as fully tested as regular releases are. But I’ve been using version 5.0.3.1 for a month now, and I wouldn’t want to go back. What are the changes? The first is in Trim Mode. Since the early ’90s, when you hovered your mouse over the Composer Window you saw three selection cursors: left, center, or right. If you hovered your mouse over a transition in the timeline, you’d saw only two — left and right, no center. That made roller selection easier and more positive. But now, with the Version 5 Smart Tool, you see three cursors in the Timeline, just like you do in the Composer. This makes it much harder to predictably select one side or the other — that pesky center cursor gets in the way. But Version 5.0.3.1 changes all that. If you enter Trim Mode by lassoing transitions or by clicking the Trim Mode button, and if the Smart Tool trim buttons are off, the center cursor doesn’t appear in the Timeline. (It’s still present in the Composer Window.) So roller selection feels much more predictable and much more like it was in Version 4. If you’ve been frustrated with Trim Mode in MC5, this fix is going to make you a lot happier. The second change is in Segment Mode. In Version 4, you couldn’t have both red and yellow segment modes on simultaneously. If red was on and you clicked yellow you simply switched from one to the other. Version 5 allows both modes to be on simultaneously — you’ll see red when you hover over the top of a clip and yellow over the bottom. 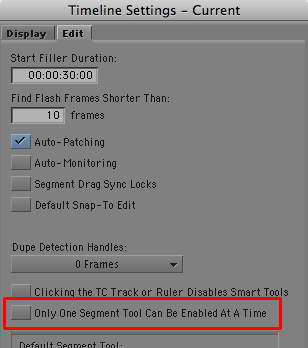 For some people that’s more flexible, but if you prefer the old way, you can now have it via a selection in the Edit tab of Timeline Settings: “Only One Segment Tool Can Be Enabled At A Time.” Turn it on and you’ll get the Segment Mode of your choice — but when you turn one on, the other goes off. Together these changes amount to a major improvement for folks like me who work in dense, multitrack timelines. The catch is that the only way to get them is via a patch release. If you’re willing to take a chance, jump in. If not, waiting till the next point release should get you these fixes in a fully tested build. Avid’s patch releases are here. Keep in mind that with Avid’s new installer, upgrading is much easier. For more about the upgrade process, see this post. This entry was posted on October 4, 2010 at 6:59 am and is filed under Avid, Avid Technical Tips. You can subscribe via RSS 2.0 feed to this post's comments. You can comment below, or link to this permanent URL from your own site. Nice to see AVID jumping into the drag and drop editing tools and trying to improve on it’s abilities… But, it would be really nice/necessity if you could a simple drag and drop of a video clip into the timeline and the audio clips would not default to the A1 and A2 tracks (only). I find it strange that AVID would go through this much trouble to create the SmartTool but doesn’t even have the very basic ability to drag and drop audio so that it matches the active audio tracks. I find it ironic that AVID is working on the important tweaks for the SmartTool… but, doesn’t seem to address more basic and fundamental concepts like the ability to drag and drop audio tracks associated with video clips to something other than the A1 and A2 tracks – ONLY.